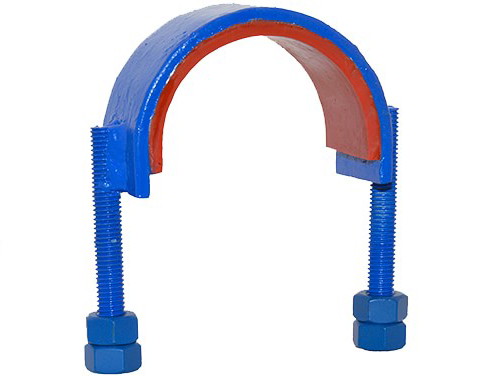 APP’s Urethane-lined Hold Down Strap is designed to protect the coating of uninsulated carbon steel pipes. We mold a heavy duty polyurethane liner to the inner diameter of our straps to ensure that delamination does not occur, even in extreme applications. Our lining material is the same that is used for pipe rollers in offshore applications. We also supply polyolefin lined U-bolts for lighter duty applications. We can supply both in your desired finish: galvanized, Xylan coated, or Teflon coated. The strap’s heavy duty build permits it to be a solution for situations in which a U-Bolt is too weak and a hold down clamp would be overkill. Molded into hold down strap’s inner diameter and heat cured for high performance protection. Custom manufacturing Other sizes and special configurations available upon request. Metal can be galvanized, Xylan coated or Teflon coated. Urethane properties can be modified if necessary for temperature or hardness parameters.